Aims: The purpose of this study was to compare performance of two these WBGT measuring devices. Materials and Methods: This study was performed in the climatic chamber located in Health School of Isfahan University of Medical Science. The WBGT Casella and the WBGT Model 686 were placed a wide range of hot/dry (28.5-38.5°C) and hot/wet conditions (25.9-37.7°C) in 3 air flow velocity (0.16, 0.27, 0.31 m/s) for 10 h in the climatic chamber. Wet bulb temperature (t nw ), the dry temperature (t a ), the globe temperature (t g ) and the WBGT were measured every 3 min for both instruments in the total period. The data obtained were analyzed by descriptive method, T-paired test and Regression analysis. Results: The result of this study showed that there were statistically significant differences in the meteorological parameter (t nw , t a , t g , WBGT) obtained from the WBGT Casella and WBGT Model 686 (P < 0.001). A high correlation also was seen between the values obtained by the WBGT Casella and the WBGT Model 686 (r = 0.993). Furthermore, there were statistically significant differences in the air flow velocity parameter (0.157 m/s) and (0.27 m/s) and (0.314 m/s) in a hot/dry (r = 0.994) and (0.980) and (0.994) respectively. There were statistically significant differences in the air flow velocity parameter (0.157 m/s) and (0.27 m/s) and (0.314 m/s) in a hot/wet (r = 0.980) and (0.992) and (0.973) respectively. 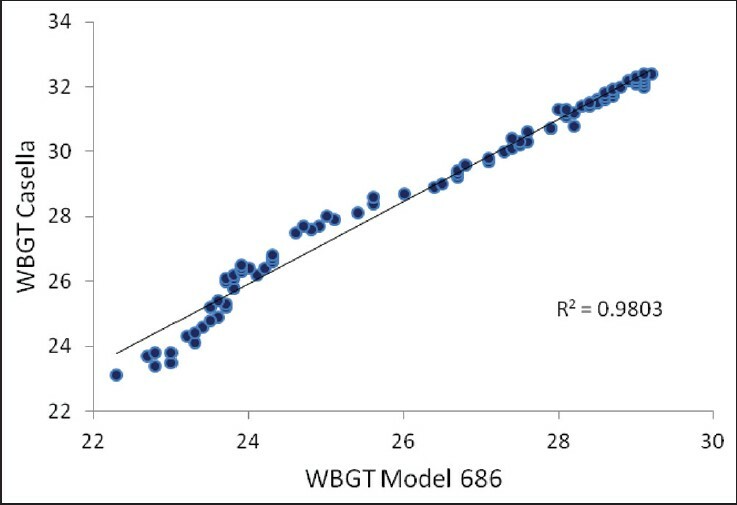 Conclusion: Since there is a high correlation between the values recorded by two devices and a remarkable cost - efficacy of WBGT Model 686 , using WBGT Model 686 is an acceptable method for measuring the heat stress if the prediction equations are utilized. According to the different temperature conditions, was obtained dry temperature, wet temperature and globe temperature both devices measurement in different climatic conditions equation WBGT Casella = 2.04 + 1.03 (WBGT Model 686 ). About 2 units WBGT Model 686 lower than the WBGT Casella and recommend the measures to be considered in this case as well as the manufacturers also, recommend doing that the reform of sensor measurements and the calculation methods. Aim: This study was carried out to investigate the quality of Mobarakeh ambient air in terms of suspended particles and heavy metals. Material and Methods: The current study was carried out in Mobarakeh city, Isfahan, Iran. Air sampling was performed in three sites for a 1-year period (in 2007). Measurement of total suspended particles (TSP) and heavy metals was achieved using high volume air sampler with fiberglass filter. The concentration of heavy metals, including Pb, Ni, Zn, Fe, and Cu was measured by atomic absorption spectrometry. Results: The average concentration of TSP was maximum and minimum in autumn and spring, respectively. In addition, the average of annual TSP concentration (124.61 mg/L) was more than World Health Organization (WHO) and US Environmental Protection Agency standard values. The analysis of filtered suspended particles for heavy metals showed the highest concentration for Iron. The average annual concentration of Nickel was also more than its proposed standard by WHO. 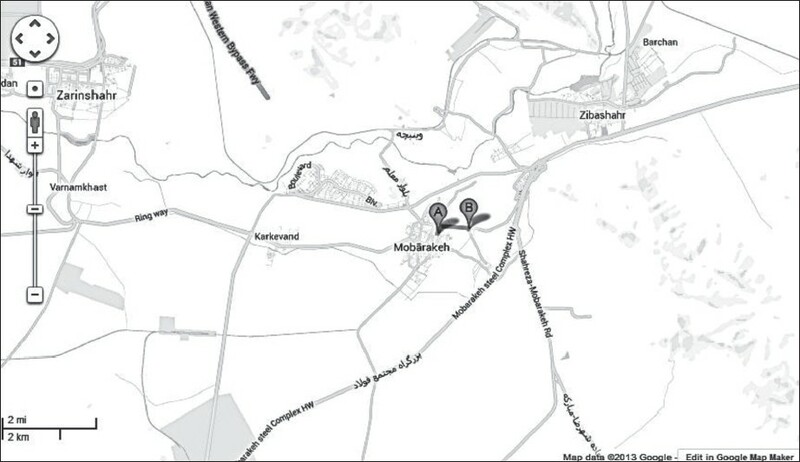 Conclusion: This study showed that ambient air of Mobarakeh city is polluted by TSP. The high concentration of Fe and Ni in this area may be attributed to the nearby industrial emissions. Therefore, in industrial areas, efforts should be taken to control the atmospheric pollution in order to protect humans from hazardous health effects of these potentially toxic pollutants. Aims: In accordance with the Air Clean Act developed for ozone monitoring, the measurement of volatile organic compounds (VOCs) based on photochemical assessment monitoring stations (PAMS) was carried out. 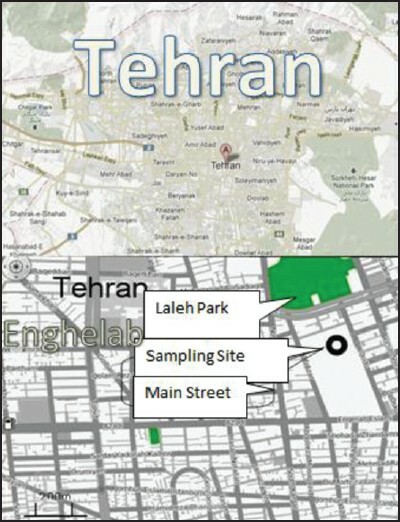 Materials and Methods: Thirteen species of VOCs were measured on Enghelab square in Tehran by PhoCheck PID Detector at morning, noon, and afternoon for 3 months. The data were reported as descriptive statistics. Results: Most of the VOCs species showed diurnal variations with higher concentrations in the noon. The highest concentration of VOCs was aromatic group (AR: 0.549 ± 0.146 ppb). AR was the main contributor to photochemical smog. Conclusion: The majority of the AR class and toluene may be followed by the impacts of heavy traffic and the peak values of VOCs concentrations occurred around mid-day which depends indirectly upon vehicles and emission of evaporations. Aim: The purpose of this study was to evaluate the concentrations of toluene and ethylbenzene inside the cars with an interior source related to in-cabin decoration and deodorizer use among Pride cars manufactured in Iran. Materials and Methods: The vehicles under study were Pride cars manufactured in Iran. In-cabin sampling was conducted by a personal sampling pump drawing air through an active carbon sorbent tube. The samples were analyzed by a gas chromatograph equipped with mass spectrophotometer detector. 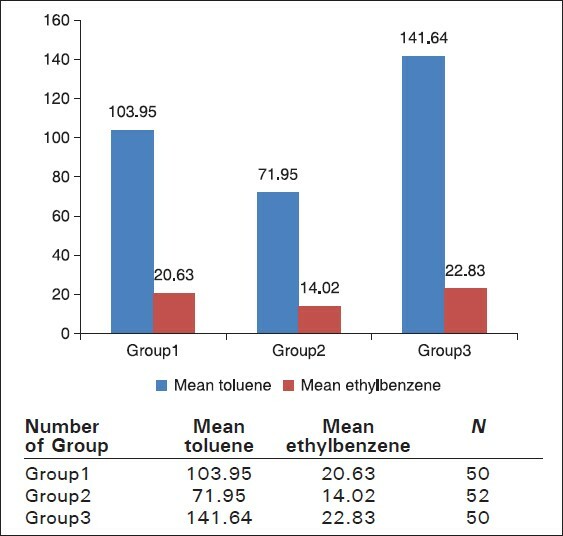 Results: In - cabin mean concentrations of toluene and ethylbenzene were 105.4 μg/m 3 and 19.09 μg/m 3 , respectively. The effects of decoration and deodorizer use inside the cars on toluene and ethylbenzene in-cabin concentrations were also not significant. Conclusion: Total means concentration of toluene inside the cars was higher than that of ethylbenzene. Models of the studied vehicles were not significantly affecting the concentrations of the target volatile organic compounds. Aims: The purpose of this article was investigating the efficiency of designing resonator in decreasing low noises. Materials and Methods: The designed Helmholtz resonator was installed in a channel analogous to ventilation channel. The resonator was produced signals at very low frequencies (125-500 Hz) and sound pressure levels 60-90 dB and transmitted through a channel by means of a speaker. Afterwards, the variation of sound pressure level was monitored and then intra-channel signals processing and preparing of sound Algorithm in channel was done by MATLAB software. Results: The highest decrease of sound pressure level at 125 Hz frequency among of Helmholtz resonators was observed at chamber diameter of 63 mm and resonator's 1 cm-caliber. Sound pressure level reductions of 0-10 dB were achieved in an experimental duct system using a Helmholtz resonator. Conclusions: This research showed that the designed Helmholtz resonators at a certain frequency of low-frequency sound demonstrated the soundest decrease. The increase in the Helmholtz resonators' chamber volume and their neck's pass area are negatively associated with the rate of sound resonance. As a result, of determining the effective frequency range of the Helmholtz resonator, the designed resonator could be applied as an effective and efficient instrument of removing or decreasing noise. Aims: In this study, the turbidity removal efficiencies of poly-aluminum chloride (PACl) and poly-aluminum chloride-sulfate (PACS) as a coagulant in aqueous solutions were compared. Materials and Methods: PACS and PACl were prepared at experimental conditions. A conventional jar test apparatus was used for coagulation experiments. Effects of different conditions such as pH (2-12), coagulant doses of PACl (0.01-1.5 mmol/L as Al) and PACS (0.01-1.8 mmol/L as Al), settling time (0-90 min), initial turbidity (7-575 NTU) on the turbidity removal efficiency were investigated. Results: The experimental results indicated that the optimum pH during the turbidity removal was 6.5 and 9.5 for PACl and PACS, respectively. The optimum coagulant dosages of PACl and PACS were achieved 0.1 and 1.22 mmol/L as Al respectively. Under these optimal conditions, the turbidity removal efficiencies of 97.85% and 95.85% were observed for PACS and PACl, respectively. Furthermore, the effects of settling time and initial turbidity on turbidity removal efficiency were investigated. The results revealed that the turbidity removal efficiency for the PACS was slightly higher than that for PACl at the same conditions. Conclusion: PACS as a coagulant improved turbidity removal efficiency compared to PACl. PACS as a coagulant can be used for drinking water treatment. 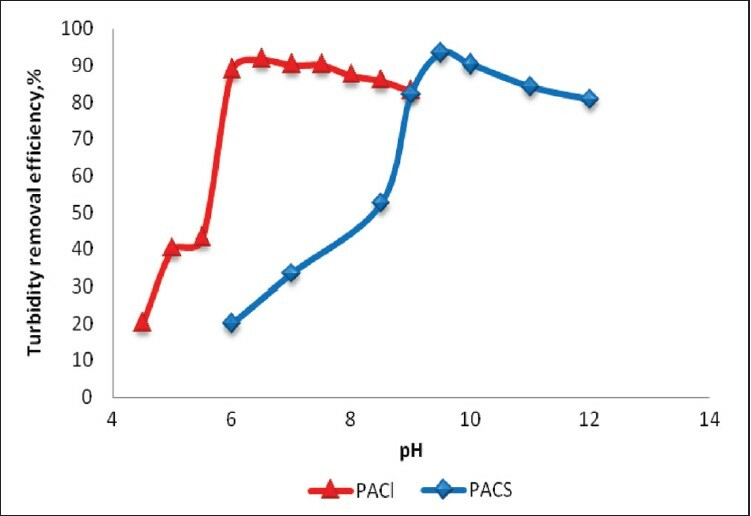 However, the dosage of PACl in comparison with PACS was lower for a similar turbidity levels. Therefore, using of PACS in comparison with PACl must be evaluated economically.